While in overall good condition, the decor and upholstery await your DIY designer touch to freshen her up. Per the Seller: Fridge, stove, cd player and A/C unit are all in good working order, as are all the electronics and ancillary solar power system. Canvas covers that fit tightly keep out the rain out and cool temps from shade inside the unit. Stock #147956 This vessel was SOLD on March 22. 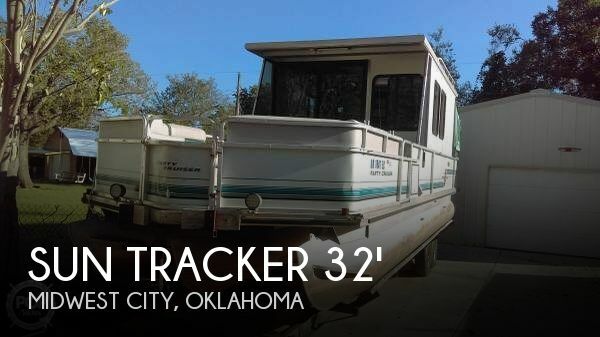 If you are in the market for a pontoon boat, look no further than this 1995 Sun Tracker Party Cruiser 32, just reduced to $13,000 (offers encouraged). 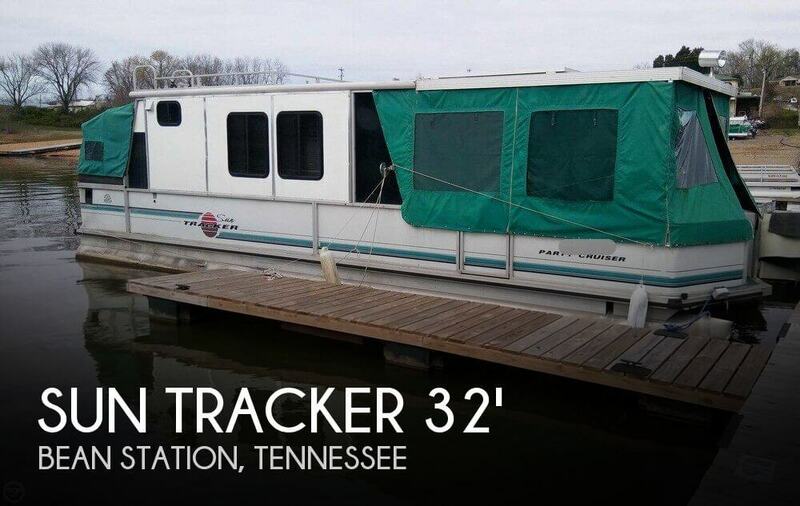 This vessel is located in Thorn Hill, Tennessee and is in good condition. She is also equipped with a Mercury engine. 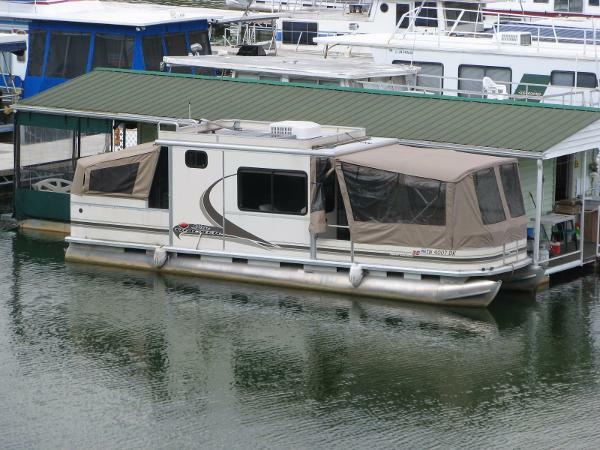 2008 Sun Tracker PARTY CRUISER 32 I/O Regency Edition 2008 Sun Tracker Party Cruiser 32' pontoon houseboat. All the amenities of home, right on the water. Outside front patio with 2-3 person lounge seats/couch, interior boasts 2 couches that convert to beds. Kitchen with AC/DC refrigerator, microwave, freshwater sink, enclosed bathroom with freshwater shower and toilet, back covered patio, sliding board with running water, ladder to top deck lounge 8.5' x 25' with safety rail, 135 HP Mercruiser I/O (4 cyl - super fuel economy), AC and heat, custom privacy shades for all windows and both sliding glass doors, propane grill, full swivel captains chair, stereo with speakers, docking lights, removable table. Comes with every single thing you need. 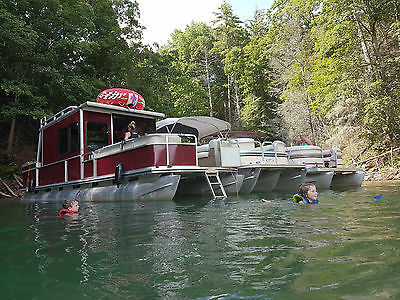 This is the most perfect family boat ever made. Wonderful for weekends with friends and family on the water. Coast Guard rated for 15 people. Holds 30 gallons of fuel and 30 gallons of water. 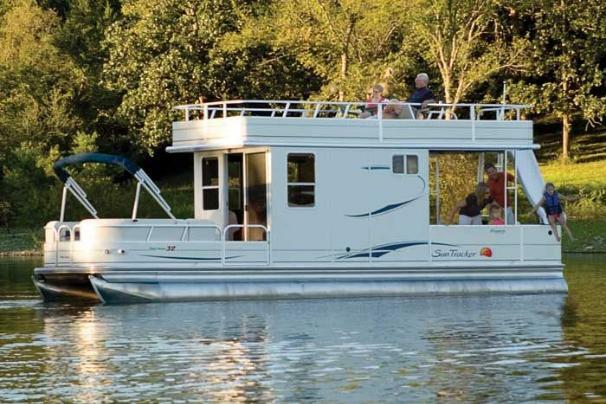 Is as wide as a standard boat so it fits at all of the restaurants, bars, and marinas on the water. All you need to do is turn the key and go! This is a brand new listing, just on the market this week. Please submit all reasonable offers. We encourage all buyers to schedule a survey for an independent analysis. Any offer to purchase is ALWAYS welcome. Take a look at ALL the photos of this vessel. We are ready to assist you with all the details, including photographing, inspections, shipping, CE certification, shrink wrap, paperwork and anything else that might come up! Please allow us to be your eyes and ears on the ground and assist you with your next vessel purchase. Thank you for visiting our listing for sale! We can assist you with shipping anywhere in the World. 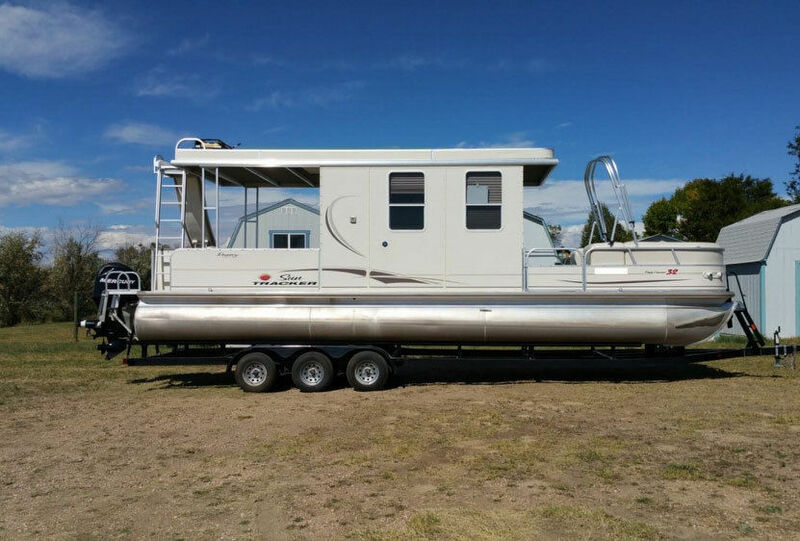 Sun Tracker Party Cruiser Pontoon Houseboat - Must See, Complete Rebuild! Hard to find! 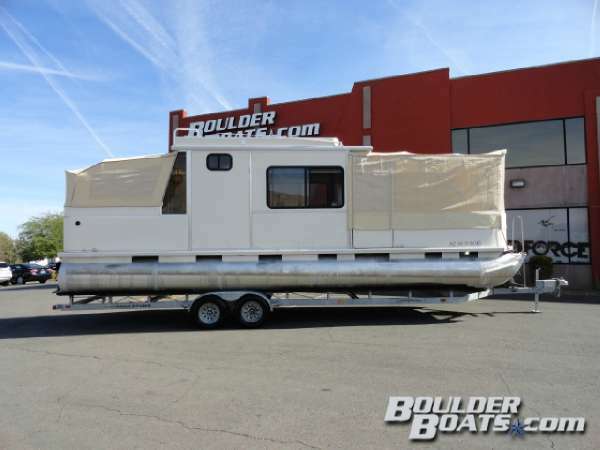 2008 Sun Tracker 32 Party Barge Regency Edition complete with a 2012 triple axle trailer, 115 Mercury 4 stroke with new prop + spare. (Was winterized and checked out by a mercury certified shop in October, hasn't been in the water since, 175.7 total hrs. on engine as verified by shop)New Minn Kota RT160 EM, 24 V, dual trolling motor, will push the boat along at 3 MPH for about 4 hours before recharge. Raymarine Dragonfly 4 Fishfinder/GPS w/ Navionics Insight chip Full canvas camper enclosure, New travel cover. AC/DC refrigerator. Microwave. New Laveo dry flush toilet. ShowerKitchen sink. New 32" roku TV.New 4K champion generator with remote start. Water slide. 5 batteries on board, 3 new! New battery isolator.1 new 12 V and 24 V charger.AC/Heat built in. All vinyl in great condition. Will sleep up to 6 people. Just had it serviced and winterized at end of season . Runs great! Everything works. 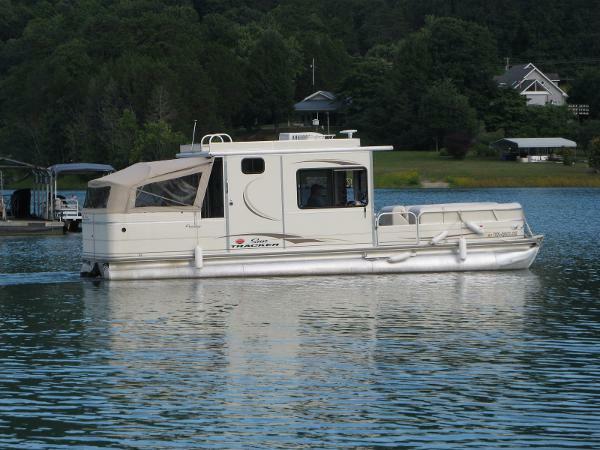 Like having an rv on the water! Contact me for more information or pics. Please Note: This is listed locally and with a national broker and may end early if sold. 2005 Sun Tracker PARTY CRUISER 32 I/O Regency Edition 3.0L MerCruiser I/O Engine w/Easy Drain Feature (No Engine Hour Meter),Power Tilt/Trim, 3000 Watt Inverter,Electric Refrigerator, Dual Burner Gas/Electric Range, Microwave, Sink,EcoSense On-Demand Hot Water Heater,Aft Couch converts to Bed,Bow Benches convert to Sun Lounges,Marine Head with Pumpout & Shower,Roof Mount Air Conditioning Unit, Front Mooring Cover & Rear Camper Canvas Enclosure,AM/FM/CD Stereo w/Aux Input for iPod,Lowrance FishFinder/GPS Chartplotter,18” Flat Screen HDTV, DVD Player,Lake Water Pump, CO Detector,Docking Lights, Remote Spotlight,(5) Batteries w/Dual & Triple Battery Chargers, Custom PWC Tow-Assist Bar,32’ Length, 8' 6" Beam, USCG Rated for 15 persons, 5,060Lbs Dry Weight,All-Aluminum Decking – One Owner –Norris Lake Slip Transferable! 2004 Sun Tracker PARTY CRUISER 32 I/O Regency Edition MerCruiser 3.0L I/O Engine w/Easy Drain Feature (No Engine Hour Meter),Power Tilt/Trim,Dual Burner Alcohol/Electric Range, Sink,Dinette and Aft Couch convert to Beds, Bow Benches convert to Sun Lounge,Head w/Porta Potti & Shower,Roof-Mount Air Conditioning Unit,Front & Rear Camper Canvas Enclosures,AM/FM/CD Stereo, Compass, Eagle Cuda Fish Finder/Depth Finder, CO Detector, Docking Lights,Dual Batteries w/Guest 10Amp Charger,32’ Length, 8' 6" Beam, USCG Rated for 15 persons, 5,060lbs Dry Weight,All-Aluminum Decking & Dual Axle TrailStar Galvanized Trailer with Brakes Included!